o The mucilage and fiber found in okra helps adjust blood sugar by regulating its absorption in the small intestine. o The fiber of okra has many superior qualities in maintaining the health of the gastro-intestinal tract. o It helps reabsorb water and traps excess cholesterol, metabolic toxins and surplus bile in its mucilage and slips it out through the stool. Due to greater percentage of water in the bulk it thereby prevents constipation, gas and bloating in the abdomen. o It is an ideal vegetable for weight loss and is storehouse of health benefits provided it is cooked over low flame to retain its properties. This also to ensure that the invaluable mucilage contained in it is not lost to high heat. o Okra facilitates the propagation of good bacteria referred to as probiotics. These are similar to the ones proliferate by the yoghurt in the small intestine and helps biosynthesis of Vitamin B complex. o For adding bounce your hair. Boil horizontally sliced okra till the brew become maximally slimy. Cool it and add a few droops of lemon and use this as the last rinse and see your hair spring back to youthfulness and jump. 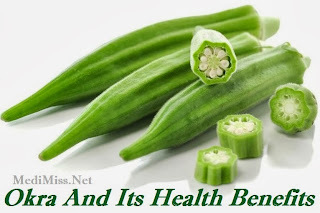 o Okra is an excellent laxative treats irritable bowels, heals ulcers and sooths the gastrointestinal track. o Protein and oil contained in the seeds of okra serves as the source of first-rate vegetable protein. It is enriched with amino acids on the likes of tryptophan, cystine and other sulfur amino acids.